Made from vintage sheets strips I must admit the thought of getting on with this was dragging me down. It took me until the middle of the month to pick it up and deal with it. I knew I had less than two weeks until the school summer holidays (and the end of the month) so needed to get on with it. It was really a bit too hot for basting but I cleaned the kitchen floor and got on with it. My last child free Friday was cut short by preschool sports event and early pick up from school for the school fair. But in that short window I quilted the whole thing in the ditch and diagonally through the blue mid stripes and even started stitching on the binding. I used my favourite stripy multi coloured vintage sheet binding (now available in my etsy shop along with a number of other stripes) and spent a couple of evenings and a sunny afternoon in the garden hand stitching it to the back. So it is finished. Now that I look at photo’s of it I’m loving it! 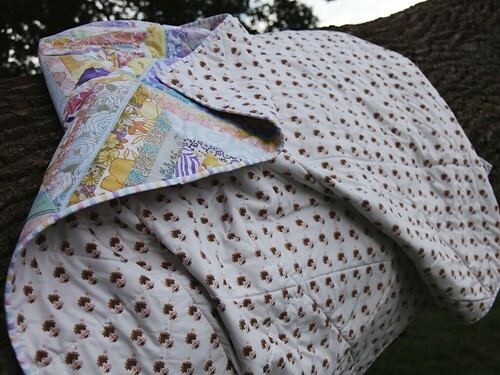 It has so many different fabrics in it, many of which have memories (recent ones about it’s discovery) attached to them, all are vintage sheets, most from the UK but a few from the US which I’ve found over here. I know that there are prints in there that will trigger different memories for some of you too. 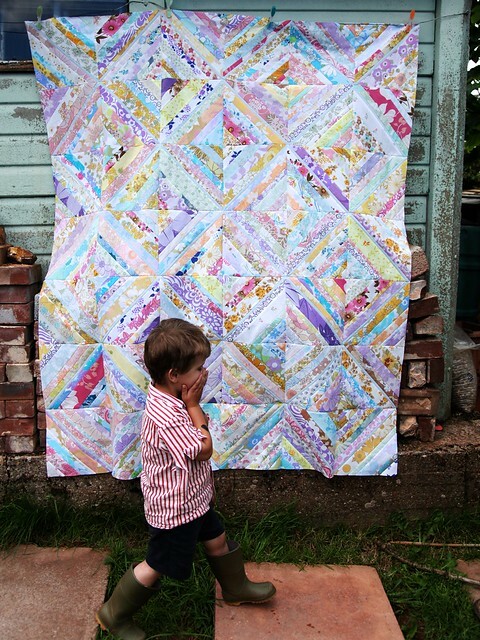 I backed the quilt with a vintage sheet I found recently and wasn’t convinced that it was suitable for cutting up into charms but I couldn’t leave it behind. It’s a St Michaels one that I’d not seen before with trees on it. 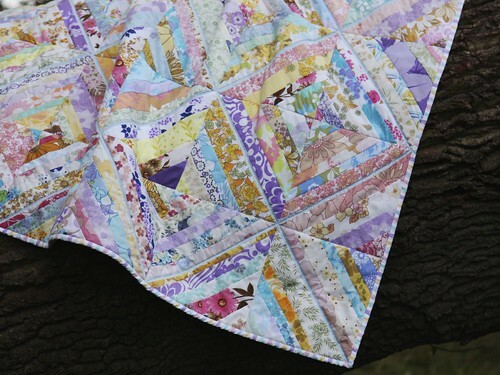 This quilt is destined to live with us, great for taking out into the garden or to the beach. Due to the fact that the fabrics have already been well used and washed countless times I think it will wear well and withstand the washing that might be required after being taken to the beach/park/garden, had salt water, ice-cream and dinner wiped on it! « My Kids Clothes Week nightmare! Mary, this is such a beautiful way to show off vintage prints. The blue strip in each block is just beautiful – love how it pulls them all together with yet another pattern. Fab finish. It is beautiful and I’m glad you’re going to keep it, ice cream and all!! Cute! Congrats on the finish. 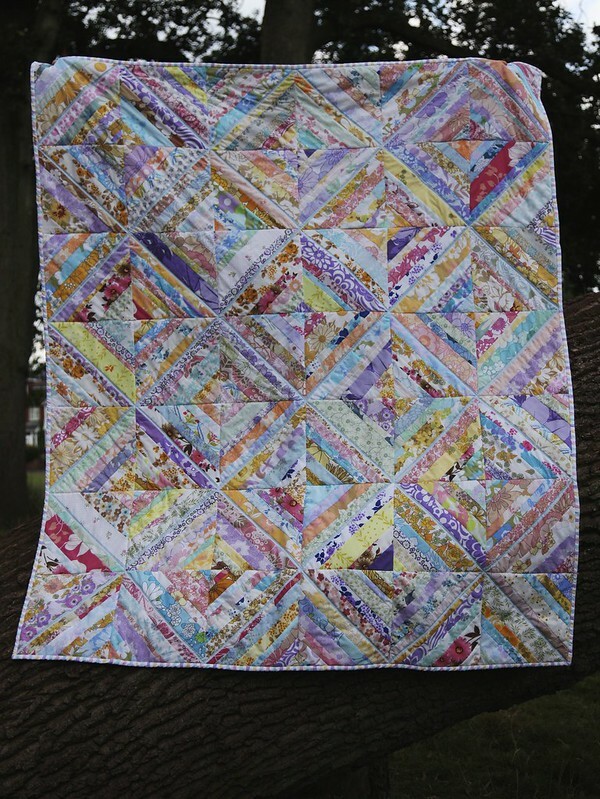 I believe quilts are meant to be used and it sounds like you will be using it frequently. 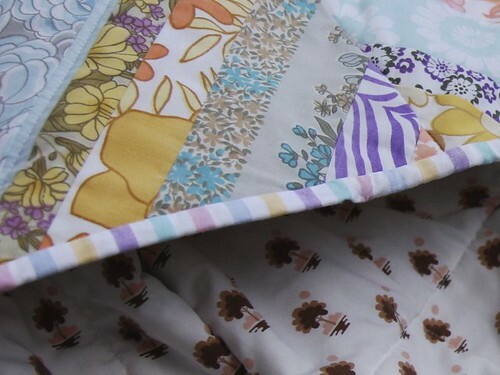 (I use vintage 100% cotton sheets from thrift stores quite a bit for backings). What a wonderful quilt! I don’t have any vintage sheets, but those colors and designs all seem to go together so well. Congratulations on finishing your goal! A beautiful quilt, Mary!!! The patterns on the vintage sheets co-ordinate so well together. It turned out so beautifully! 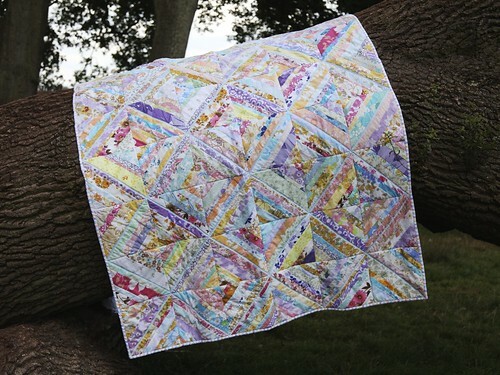 Makes me want to make a string quilt!